David Sedaris was in Vancouver last night. He is on tour, lightly promoting When You are Engulfed in Flames. But really he just popped by to read a little and make us laugh alot. God he's a funny man. It's one thing to be funny in writing. Which he is. But when writing something, you can tweek and play with it until the words elicit the intended response. But to be funny in person, and to make it appear to be spontaneous? Well that's an entirely different talent. He's got this amazing delivery, pausing at just the right moment, dropping his voice just a touch, staring into nothing, and then dropping the bomb. But back to his writing. What I found truly amazing (if not somewhat unbelievable) were the diary exceprts he read. How can someone be that witty in their personal diary? Now he did say that most days were just mundane ramblings, but the days he read us? Brilliant. Like his recollection of his stop in Pittsburgh and the people that picked him up from the airport. The woman and man (let's call them Sally and Bob) worked for the literary foundation where Sedaris was giving a reading and Bob was wearing a jacket with a green sweater underneath and talking about remodelling their kitchen. Once Sedaris and Sally were alone he asked how long Bob and his boyfriend had been together. Sally said Bob didn't have a boyfriend. Sedaris then said well does he live with his parents then? Sally said no, he was married with two children. And Sedaris said, BUT HE'S GAY!!! And on it went. I know it's not as funny when I write it. That's why my name isn't David Sedaris (and for other obvious reasons). But trust me, it was funny. I have read Sedaris's books, but have never seen him live. Glad to know that he is just as funny as his writing. 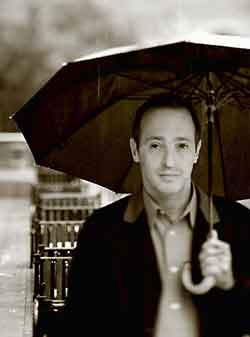 I so love David Sedaris too. His whole family is hilarious. It must be a comic timing gene. david sedaris is one of the best things on planet earth today. i saw him perform last year, and i have seen him before. he is amazing. his books are so great, and his readings in person do NOT disappoint! and i always wish i was born into the sedaris family! wah.